Not too long from now, a four-lane highway will link Cape Town and Cairo, punctuated with one-stop borders and shiny new service stations sporting motels and fast food outlets. Mercifully, that time is not yet here. It takes four days to drive to Nairobi, excising a good-sized chunk of the annual holiday allowance. 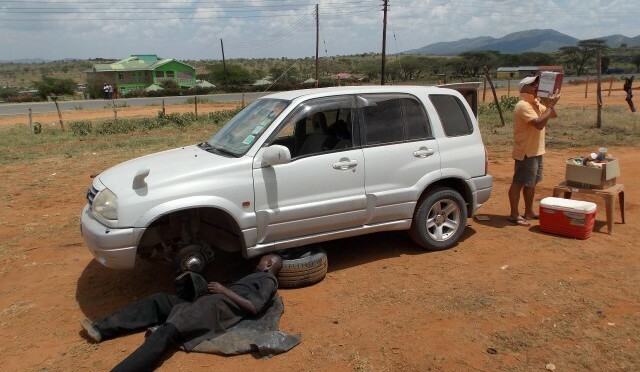 A quick self-drive trip to Kenya, therefore, is out of the question, but fly-drive is not. Both SAA and Kenya Airways offer daily direct flights and Kenya’s hire cars are generally reliable, although obviously you get what you pay for, as we would find out. On arrival, we spent a couple of nights in Nairobi from where the overnight train delivered us, a respectable two hours late, to Mombasa. It’s now a twice-in-a-lifetime experience for me and the faded colonial glory is more faded than ever. The liveried crockery has been replaced with melamine and the seats are patched and torn but the chicken-or-beef at dinner is edible, breakfast is still just recognisable as breakfast and the sheets are clean. It is memorable but don’t leave it too long if you want to do it. Evidently, it will finally come off the rails completely quite soon. From Mombasa, a matatu minibus-taxi was the cheapest way to lug our kit to Diani Beach, where we passed a couple of easy days on the beach, whiling away the drinking hours at Ali Barbour’s Forty Thieves beach bar and dining in the Coral Cave restaurant. Picking up, from a local car hire outlet, a Suzuki 4×4 which we nicknamed Suzi Quatro, we pointed out to management during negotiations that the vehicle rattled like a stock car, had no suspension and needed two hands to push up the electric window on the passenger’s side. Management, in turn, was honest enough to point out that the fuel gauge was permanently stuck on three quarters and advised zeroing the tripometer each time we filled up. Haggling over, we swerved Suzi Q through the potholes and back to our campsite, where we packed her up for her mission. The airline had allowed us to bring along a small tent, sleeping mats and sleeping bags, all tied into one bundle, and I had a squashable cool box which I was using as hand luggage. On a two-week trip at a warm time of the year, very little is required to be comfortable, so we needed to pick up just a small selection of cheap knives, forks and plates and a couple of pots. The route from Mombasa to Voi has recently been resurfaced but the chaos on Kenya’s railways is not limited to passenger services. Consequently, the road takes an absolute pounding from the trucks that carry freight and fuel from the second city to the capital and beyond to Uganda. While most major towns and cities now boast a Nakumatt supermarket – think Game combined with Checkers – in small towns such as Voi you need to rootle around. All the shop fronts sport the same cellphone company liveries and while some might be no more than kiosks selling soap, headache tablets and bottled water with their airtime, others can lead into deep labyrinths of shelves filled with every tin and package you could hope for. I also had a vague recollection from an earlier visit of a petrol station selling ice and unearthed it on our way into Tsavo East. It was a little luxury that would change everything. Cold water. Cold beer. Fresh milk. The debate will always rage between the respective champions of the two halves of Tsavo, the East and the West being operated as separate National Parks divided by the main road, but what will always be certain is that both hold iconic status, dating back to the days of the pioneers. It was here in Out of Africa that Karen Blixen’s life changed forever. Remember the romantic images of Robert Redford and Meryl Streep in his yellow bi-plane circling above vast herds of buffalo and loping giraffes? The rawness goes back even further in time, to the man-eating lions of Tsavo chomping their way through the railway workers, as portrayed in The Ghost and the Darkness. For me, the two parks are equally worth a visit. The mostly flat Tsavo East arguably offers better game-viewing, albeit in a small area. The northernmost sector is closed to due to poaching issues, but the close-up lion sightings of the Kanderi Swamp, next to which the Ndololo campsite lies, and the vast herds of mud-red elephants are hard to beat. It’s a great place for gazelles, both Thompson’s and Grant’s, and for gerenuk. In Tsavo West on the other hand, the game is shyer, but scenically, the area is far more impressive. The Chaimu volcano crater offers a great walk and the seemingly-endless views from Roaring Rocks and Poacher’s Lookout, both with the immortal backdrop of Kilimanjaro, are unforgettable. The public campsites in both parks are basic but comfortable and although cleanliness can sometimes be a bit last-minute – “Wow, we have people, we’d better clean those showers!” – once the team has got the idea that you are there and sticking around for a few days there’s generally hot water and sometimes even a willing soul who will collect firewood for you and do your washing-up for a few extra shillings before the baboons get to it. The post-Hemingway view of the mountain stayed with us through the astonishing 50 sq km Shetani Lava Flow to the attractively-named Maasai town of Loitokitok and on to Amboseli, one of Kenya’s more controversial parks. Whatever the political debates about its official status and the Maasai’s management, though, it still offers excellent game-viewing on windless dust-free days and that iconic photo of the elephant, the thorn-tree and the snow-capped peak cannot be better taken than from here. By now, Suzi Q was beginning to collapse under the strain, emitting some unusual knocks and scrapes which became progressively louder and more alarming, causing us finally to call the hire company, who helpfully suggested that we limp back to Nairobi, where they’d give us a replacement. The noises increased. We stopped with a roadside mechanic, spent a packet and made no progress apart from holding a lengthy debate on the guilt or otherwise of Oscar Pistorius. Suzi Q made it to Nairobi, where she was replaced by a larger, heavier Suzuki, Suzi 2, which was almost un-driveable due to broken power steering but otherwise in good shape, allowing us three relaxing nights camping on the shores of Lake Naivasha, a walk around Crater Lake and tour of Joy Adamson’s house. I also fell spectacularly off a wreck of a bicycle in the face of a surprise wildebeest assault in Hell’s Gate National Park. Camping in Africa is never for the faint-hearted, but we got it right. Somewhat dusty and bruised, we returned the remains of the second car to the airport and agreed that we wouldn’t have done it any other way. Stilts, Diani: camping, stilted rooms and a cheery bar www.stiltsdianibeach.com Camping by arrangement. Tree houses from R180 per person. Communal ablutions. Ndololo Campsite, Tsavo East; Chyulu Campsite, Tsavo West; Community Campsite, Amboseli. All managed by Kenya Wildlife Services. Safaricard, required for entrance and camping, may be bought with US dollars or Kenya Shillings from the main gates. www.kws.org. Conservation fee R585 per person per day (Amboseli R720). Camping R135 (Amboseli R225). Conservation fees are for a 24 hour period so can cover an afternoon game drive and a morning drive the following day. Cheaper camping options exist outside the parks. Glory Car Hire, Nairobi, Mombasa and Diani: the cheap and usually cheerful version.www.glorykenya.com. Avis, and Europcar also have a presence in Kenya.